The Nik Meller Collection of elegant premium grade optic crystal Awards are designed by International furniture designer and sculptor Nik Meller. Inspired by the former World Trade Centers in New York, the Bold Crystal Award exhibits two clear crystal rectangular columns ascending from a clear crystal base. The beveled black crystal center is positioned with precision to appropriately recognize an individual or group who exudes great endurance and tenacity in their respective field. Available in two standard sizes. Custom sizes and multiple color combinations available upon request. Bolsa Chica is part of the Chien J. Wang Collection designed by international designer Chien J. Wang. 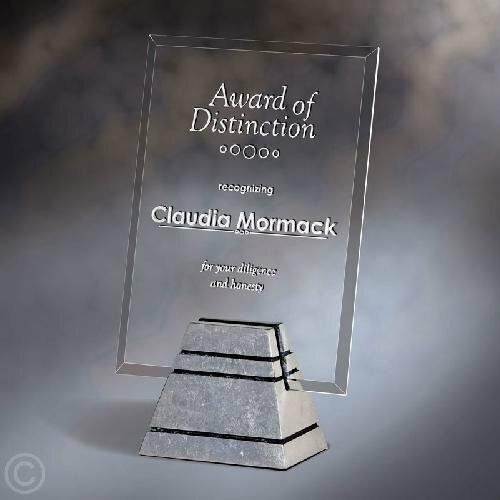 The award is a rectangular piece with a slight arc and a small blue crystal design in the front. A large imprint area makes this a great piece. A beautiful award molded to look like a closed book with bindings. This award is perfect for any scholastic or literary accomplishments. 4" x 3" x 1 1/4"
5" x 3 3/4" x 1 1/4"
6" x 4 1/2" x 1 1/4"
This pair of bookends is a wonderful and functional gift. With rounded arches and a cut-diamond pattern, your recipient will be thrilled to show off this gift made of optically perfect crystal.